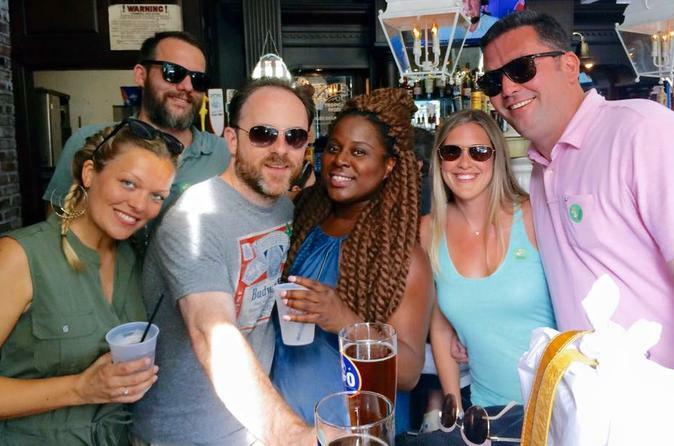 On The Independence Pub Crawl you'll visit 4 historic pubs along Boston's legendary Freedom Trail with an expert guide who will share unknown stories of colonial Boston and the American Revolution while you enjoy local craft beer and the company of fellow travelers from around the globe. The Independence Pub Crawl lasts 2 hours and 15 minutes and begins at the Sam Adams Statue in front of Faneuil Hall. Come laugh and learn over some beer. Cheers! Begin your Independence Pub crawl at the statue of the man that helped spark a revolution: Sam Adams. In front of this Boston icon, you will meet your expert guide as well as fellow history loving beer drinkers from around the globe. From there, the beer and history flow as your guide leads the group around the colonial market places of Faneuil Hall and Quincy Market. You'll walk the cobblestoned streets to pubs that have been visited by Bostonians for hundreds of years. The four historic taverns visited on the tour provide a wonderful backdrop as your guide tells stories about Boston's rebellious past that helped lead to America's independence. Each tavern dates back at least to the 1800's, several even further which includes America's oldest tavern! At each tavern your guide will recommend beer as unique as the history of the city. Most of the beers are exclusively served in Boston and several can only be found in the taverns visited on the tour!